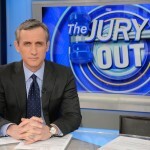 Dan hosted another segment of Jury’s Out with the Good Morning America anchors on April 16th. First up on the docket, a Florida school board member is trying to demand that parents adhere to a dress code when dropping their children off for school. The logic behind it is that parents should set the example for their children. Dan thinks the school board member has a point, however, no one else on the “Jury” seems to agree. The next topic up for discussion, a labor union in France is trying to make it a law that employees get at least 11 hours without emails or other work communications, while 71% of the flash poll said that after hours emails should be banned, Dan’s opinion differs. The final topic this week, when you order take out food, should you tip? America seemed to be divided on this one. Watch what Dan and the anchors had to say here.